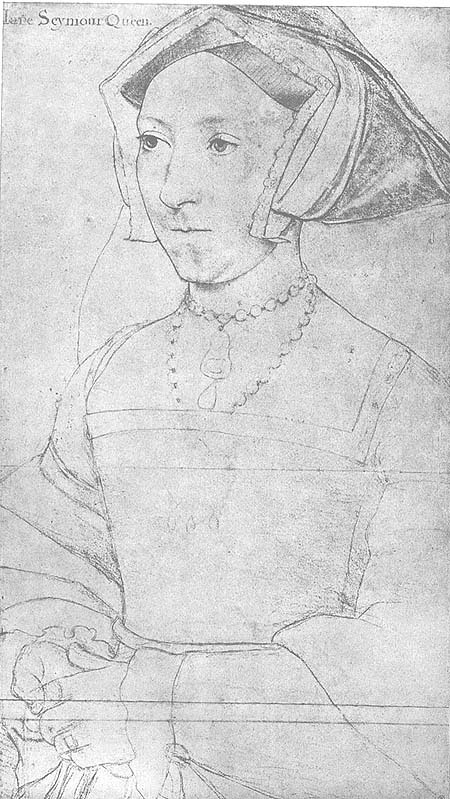 a panel painting by Holbein on the same scale as the preliminary sketch, "the countours of which were traced and transferred to the ground of the panel through an intermediate sheet covered with black chalk. The metalpoint and pen lines in the face and headdress correspond to the underdrawing on the panel that has been revealed using infrared reflectography (IRR)." (p. 114) This painting is now housed in the Kunsthistorisches and is referred to below as the "Vienna painting." a good quality painting, probably also done from the sketch, but by another painter in Holbein's studio. This version is housed in the Mauritshuis, The Hague, and is referred to below as the "Mauritshuis painting." Vienna: the jewels on the headdress and neckline are clusters of 4 pearls interspersed between jewels set in a quatrefoil of gold. Mauritshuis: large pearls separated by gold cylindical beads in the necklace and small gold rounds at the neckline. This design more closely corresponds to that in the sketch. Vienna: the pendants are similar in design, though this pendant has slightly smaller stones in a slightly larger gold setting. The pendant hangs from the string or wire used to thread a cluster of pearls. Mauritshuis: the pendant hangs directly from a pearl. 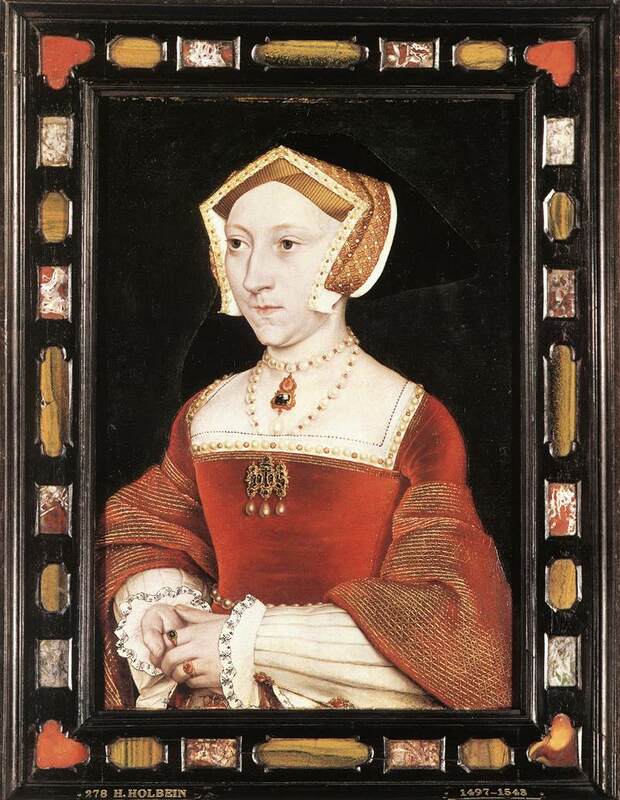 This is considered to be one sign that the painting is a copy rather than a true Holbein. A pearl would not be able to support the weight, a mistake that Holbein, as a jeweller, would not make. Mauritshuis: the same pendant is depicted. Vienna: the girdle/belt follow the same pattern of pearl clusters and jewels as the neckline and necklace. In this version you can also see the elaborate chain of perals and jewels hanging from the girdle. Mauritshuis: the girdle/belt is the same pattern as the neckline/necklace. The portrait is not a full three-quarter length so you cannot see the details of the chain hanging from the belt. It appears to be something more than just pearls. Mauritshuis: the folds are slightly different and the detail of the embroidery is not quite as clear, but the pattern is the same. Vienna: the false undersleeve is quite different. In this version the material is a silver brocade. 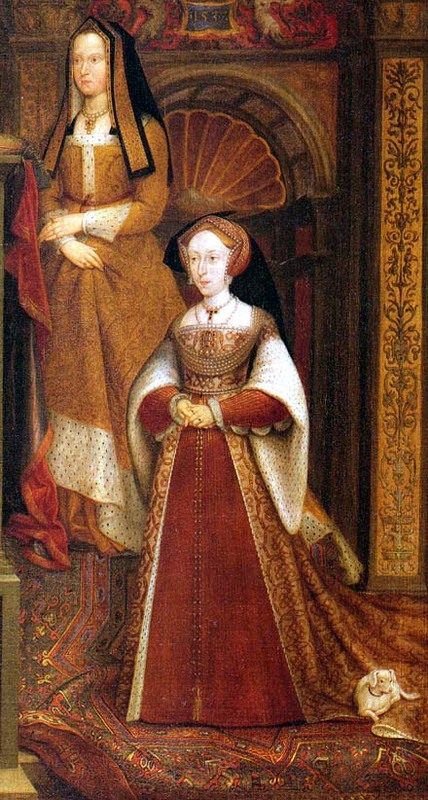 "Holbein worked silver leaf into the brocade of the sleeve and skirt." (p. 115) The panel is flat and held together on the underside by jewels similar to those in the necklace, though their setting is slightly more elaborate. Mauritshuis: the material is white and pleated in a manner similar to that of other paintings (example: Lady Guildford). It appears to be satin. 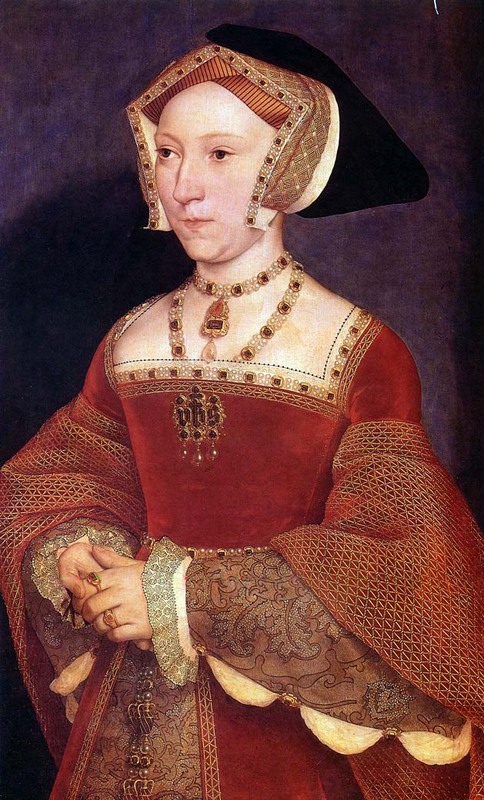 It is not as large as the silver brocade undersleeve depicted by Holbein. It is held together by double jewels in a gold setting that is more elaborate than those of the Vienna painting. Vienna: the shift neckline is edged in black with white-on-white embroidery. The material pulled through the false undersleeve is very full and light (silk?) and the blackwork at the cuff is a geometrical pattern about an inch and a half wide. Mauritshuis: the neckline is similar to the Vienna painting. The sleeve does not appear as full. The cuff embroidery is more floral than geometric and is less than an inch wide. It continue up the sleeve and can be seen pulled through the false undersleeve. Mauritshuis: the sleevehead shows a fold or seam that is slightly off the shoulder/armscye line and that curves as it goes over the shoulder. This corresponds with the shoulder construction shown in the sketch. Vienna: gown front closure appears to be secured by gold-headed pins. Mauritshuis: same design, though the pin heads appear slightly larger. Vienna: the headdress design is similar in both. The geometric fabric design of the lappet is quite clear. The treatment of the jewels follows the pattern of that in the necklace. Mauritshuis: the geometric fabric of the lappet is not rendered as clearly, though the pattern is similar. The jewels are more like the sketch. There are clusters of pearls surrounding a gold round. Buck, Stephanie and Jochen Sander. Hans Holbein the Younger: Painter at the Court of Henry VIII. London: Thames and Hudson, 2003.